When you need to lift something heavy—really heavy—your best bet is always BendPak. Our super-duty models are pure brutish muscle. This XPR-18CL, for instance, has an astounding 18,000-lb. capacity and features heavier column construction, carriage construction and frame components than ever before. Like all our clearfloor lifts, this lift offers superior direct-drive performance, cutting-edge technology, top of the line materials and design that's ahead of its time. 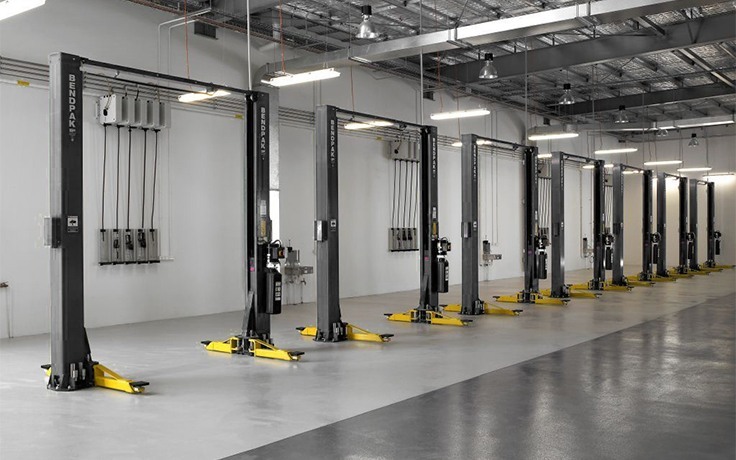 Fits in shops with ceilings higher than 14', and it won't crowd your floor while you work beneath a vehicle..
Shops that work on massive fleets and vehicles need a powerful car lift with a small footprint, so only BendPak’s 18,000-lb. capacity XPR-18CL will get the job done safely and efficiently. It offers the most extraordinary lifting capacity of any two-post lift we make, which means you get the best column, carriage and frame component construction we offer. This model fits in shops with ceilings higher than 14 feet. With an XPR-18CL two-post car lift, you will service an incredibly diverse array of vehicles. High-capacity two-post lifts are commonly known as “all-service” lifts. Given their versatility, they’re the most common lift type found in professional shops. 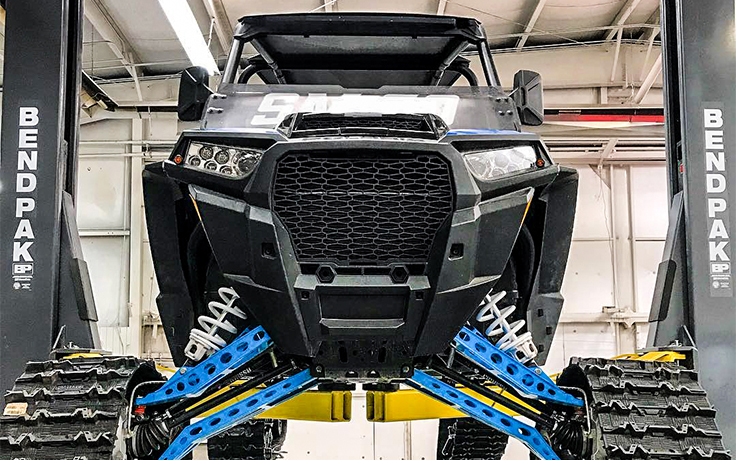 And, because they’re going to be in so many shops, it’s important that the XPR-18CL can lift any vehicle that falls well under the max weight capacity. This means the telescoping arms will adjust to fit under race cars and other low ground-clearance vehicles. In addition to smaller cars and light trucks, it will also lift oversized equipment: trailers, farming equipment, commercial trucks, etc. The columns are built wide enough to accommodate just about any vehicle up to 18,000 lbs., making the XPR-18CL ideal for service shops that want to be prepared for the anything. The only way to get more lifting power from a BendPak lift is to move into four-post lift territory. However, for a smaller footprint, extreme power and majestic durability and safety, you can’t do better than the BendPak XPR-18CL. Hydraulic lines on heavy-duty lifts are best kept up and out of the way. With our Clearfloor design, there’s no risk of massive vehicles running over cables and damaging the integrity of your lift. BendPak’s dual-cylinder Direct-Drive technology offers superior hydraulic lift. Each reinforced steel column holds a hydraulic cylinder to ensure a safe, even lift every time. Heavier two-post lifts are ideal for Direct-Drive technology because there’s no need for what would have to be a massive chain-over system. If you’ve never bought a BendPak Dual Direct-Drive hydraulic lift before, you’re in for a treat. The hydraulic cylinders never leak, due to superior construction and attention to detail during the most delicate phases of the manufacturing. The chrome rod is made of C-1045/50 micro-alloy and plated to a minimum of .001" diametrically. This results in a high-durometer rod seal that is machine-loaded at a crucial, delicate phase of construction to prevent any fluid leakage. A urethane rod wiper provides exclusion protection. BendPak is careful to design and test our car lifts to go beyond ASTM specifications, and our powerful, no-leak hydraulic cylinders are one of the top-mentioned reasons customers come back to buy from us time and time again. The XPR-18CL two-post lift is durable enough to lift a massive amount of weight. However much space between the garage floor and your vehicle’s lift points, our smart, telescoping design and no-scratch pads make every lift safe and easy. This lift services sports cars and low-profile compact vehicles, no problem. 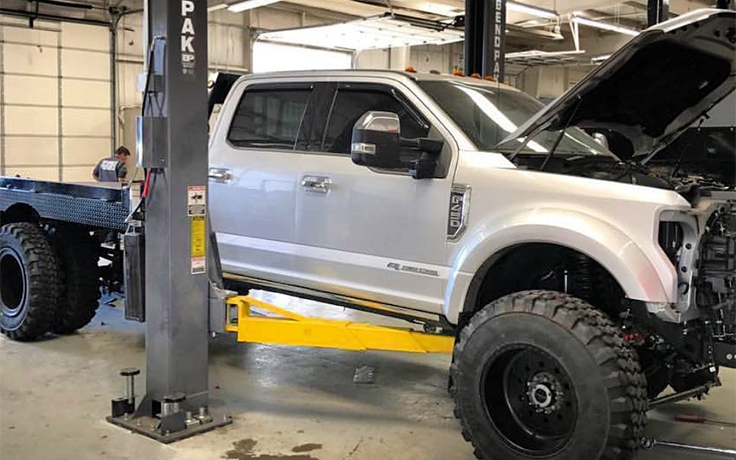 If we raised the lift capacity but lost the ability for our powerful lift to service more commonly used vehicles, we’d be limiting what you can do with our lifts. BendPak’s heavy-duty lifts are always sure to expand your lifting potential. 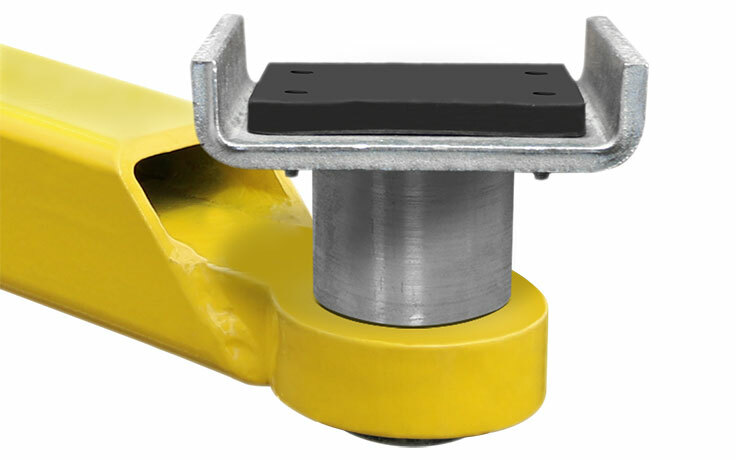 While our XPR 9 and 10 Series two-post lifts have been refitted with new 63 mm screw pad assemblies, we know that heavy-duty lifting applications call for specialty adapters. BendPak stands at the forefront of innovation, from our massive, signature lift columns to our less-talked-about adapter kits. Nothing goes overlooked, and with a 16-piece adapter set, you never have to worry about being unable to reach a lift point on your vehicle frame. 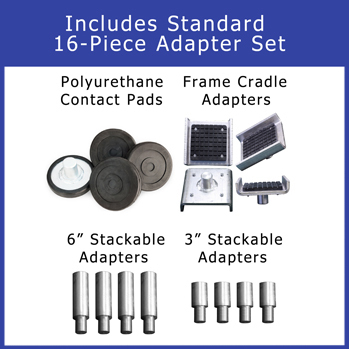 The included set includes four 3” and four 6” stackable adapters, four polyurethane pads and four cradle pads. This lift is designed with lowered arm tube supports to ensure ease-of-access with every vehicle type. Rest assured that your heaviest lifting applications are secure on a BendPak two-post lift. Automatic restraints are powerful enough for massive trucks and trailer up to 18,000 lbs., yet nimble enough to reach under delicate, easily scratched sports car chassis. The XPR-18CL is versatile enough to handle almost any vehicle you need to work under. The 53” lift carriage is essential for heavy lifting. Our competitors' designs often feature lower columns and don’t compensate for loss the structural integrity in their engineering (a.k.a., they rip you off). The XPR-18CL is designed to safely lift massive vehicles, so we know the value in telling you the truth. We don’t cut corners on design. BendPak uses UHMW (ultra-high molecular weight polyethylene) load bearings because they’re virtually indestructible and never require operator maintenance. All of BendPak’s two-post lift columns are made from a single piece of steel in order to better distribute weight down the beam and extend the life of your lift. An easy-to-reach, single-point release is ergonomically located for your convenience. Immediately and safely stop all procedures at any time during ascent and descent. A commercial truck is a heck of a thing to lift, and any disproportionate weight displacement would be disastrous. Whatever you’re lifting on the XPR-18CL, BendPak’s unique dual-syncho equalization system is specifically designed to keep heavy vehicles balanced as they rise. Any vehicle that touches the overhead structure will trigger the entire operation to shut down. It’s just another way BendPak works to ensure your safety. BendPak’s 3/8" hydraulic lines deliver along with a high-flow pump and integrated AC power-unit. In other words, we lift you up and get you down fast. The XPR-18CL-192 is our tallest and highest-capacity car lift. Extended-length columns mean the tallest heavy-duty vehicles can be serviced in your shop without sacrificing any of our crucial safety features and performance expectations. 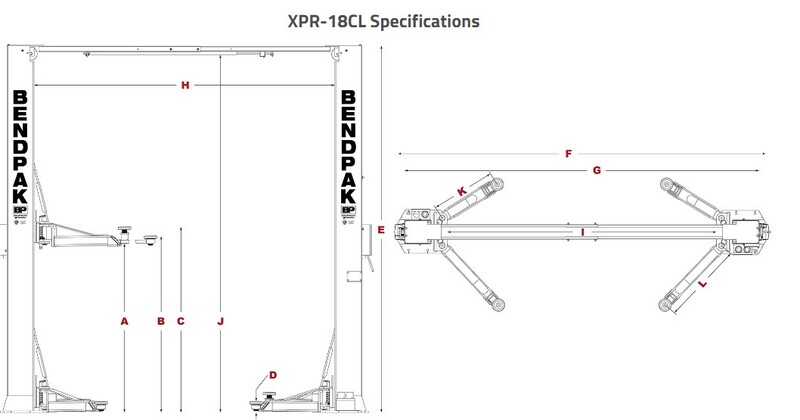 Click the button below to add the BendPak XPR-18CL 18,000 Lb. Capacity, Clearfloor, Standard Arms to your wish list.